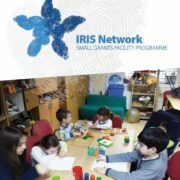 IRIS Network has conducted the Small Grant Facility (SGF) Programme, through which 13 local initiatives for long-term improvement of social services provision and delivery were supported in Bosnia and Herzegovina, FYR Macedonia, Albania, Kosovo, Montenegro and Serbia. Grants in amount up to € 5,000.00 were awarded to IRIS Network members in order to strengthen their organizational, communicational and advocating capacities as well as to assist the grantees in delivery of appropriate services for various vulnerable groups in their countries. » Main goals of the project proposals had to include the development of sustainable mechanisms of standardization and quality improvement of existing social services and/or creation of the framework for appropriate services delivery where that is missing. » Active participation of the representatives of target beneficiary groups and the public in foreseen activities and discussions was required, as well as their involvement in the process of local polices development. Local and grass root advocacy initiatives were prioritized. » Analysis, advocacy and monitoring of social sector reforms at regional and local levels were even a precondition for applying. The grantees also had to be located in the target countries, publicly recognized and independent from the government. All of the projects have been implemented for six months. Is that period long enough to create and insure the actual changes in the social environment? Find out in the following bulletin.